The Spiritual Exercises is one of the most influential spiritual texts of all times. Despite their Reformation origins they are nowadays used as a medium for spiritual guidance and retreats among an ecumenical spectrum of Christians. The text is not intended to be inspirational but is a series of practical notes for a retreat-guide that suggest how to vary the process according to the needs of each person. The ideal is a month away from normal pressures but a modified form “in the midst of daily life” is allowed. Much of the text consists of advice about the structure and content of prayer periods, guidance about spiritual discernment and making a choice of life, and helpful hints about practical matters such as the physical environment for prayer, moderate use of penance, rules about eating, and about scruples. The explicit aim of the Spiritual Exercises is to assist a person to grow in spiritual freedom in order to respond to the call of Christ. From the Exercises, it is possible to detect fundamental features of Ignatian spirituality. First, God is encountered above all in the practices of everyday life which themselves become a “spiritual exercise.” Second, the life and death of Jesus Christ is offered as the fundamental pattern for Christian life. Third, the God revealed in Christ offers healing, liberation, and hope. Fourth, spirituality is not so much a matter of asceticism as a matter of a deepening desire for God (“desire” is a frequent word in the text) and experience of God’s acceptance in return. The theme of “finding God in all things” suggests a growing integration of contemplation and action. The notion of following the pattern of Jesus Christ focuses on an active sharing in God’s mission to the world—not least in serving people in need. Finally, at the heart of everything is the gift of spiritual discernment—an increasing ability to judge wisely and to choose well in ways that are congruent with a person’s deepest truth. From A Brief History of Spirituality by Philip Sheldrake (Blackwell Publishing, 2007). On this day that the Church rememebers his life, I wanted to something from share the fourteenth chapter of Book one of THE IMITATION OF CHRIST by Thomas À Kempis. If you rely more upon your intelligence or industry than upon the virtue of submission to Jesus Christ, you will hardly, and in any case slowly, become an enlightened man. God wants us to be so completely subject to Him and, through ardent love, to rise above all human wisdom. Holy Father, Who has nourished and strengthened Your Church by the writings of Your servant Thomas a Kempis: Grant that we may learn from him to know what we ought to know, to love what we ought to love, to praise what highly pleases You, and always to seek to know and follow Your will; through Jesus Christ our Lord, Who lives and reigns with You and the Holy Spirit, one God, for ever and ever. Amen. According to Church tradition, she remained in Rome until the arrival of the Apostle Paul, and for two more years still, following his departure from Rome after the first court judgment upon him. 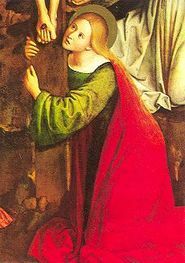 From Rome, Saint Mary Magdalene, already bent with age, moved to Ephesus where unceasingly labored the holy Apostle John, who with her wrote the first 20 Chapters of his Gospel (John 1-9, John 10-20). There the saint finished her earthly life and was buried. O Almighty God, Who by Your Holy Spirit has made us one with Your saints in heaven and on earth: Grant that in our earthly pilgrimage we may ever be supported by this fellowship of love and prayer, and know ourselves to be surrounded by their witness to Your power and mercy. We ask this for the sake of Jesus Christ, in Whom all our intercessions are acceptable through the Spirit, and who lives and reigns for ever and ever. Amen. This is a beautifully spiritual video, that Fr. John mentioned in the comments. There is a deep connection between Christian spirituality and creation that we often miss. You don't need to understand the Serbian words to see the Gospel in the video. O God, enlarge within us the sense of fellowship with all living things, for our brothers and sisters, the inarticulate beasts, to whom You gave the earth as their home in common with us. We remember with shame that in the past we have exercised the high dominion of humanity with ruthless cruelty so that the voice of the earth, which should have gone up to You in song has become a groan of anguish and a cry of torment. May we realize that they live not for us alone, but for themselves and for You, and that they too love the sweetness of life. Amen. I haven't volunteered at our local hospice since my brother and dad died, but last week, I got an email saying that they had a man who just might need a friend to walk with him a while, so I thought that this is just as good a time as any to return. I can tell you that R does have a heart for people and God's creation, he was so worried about the birds who came to the feeder outside his window. The local heat made him concerned for them, that they would have plenty of water. R has been a kind, man telling me things of his life over the last week and a half or so, and has certainly ministered to me. However, last night his illness has entered it's final phase. So tonight, I pray the Ministration at the Time of Death (last Rites) for R, and if you are so inclined, lift him and his family to the Throne as R leaves this mortality behind and puts on immortality and behold the Face of God.